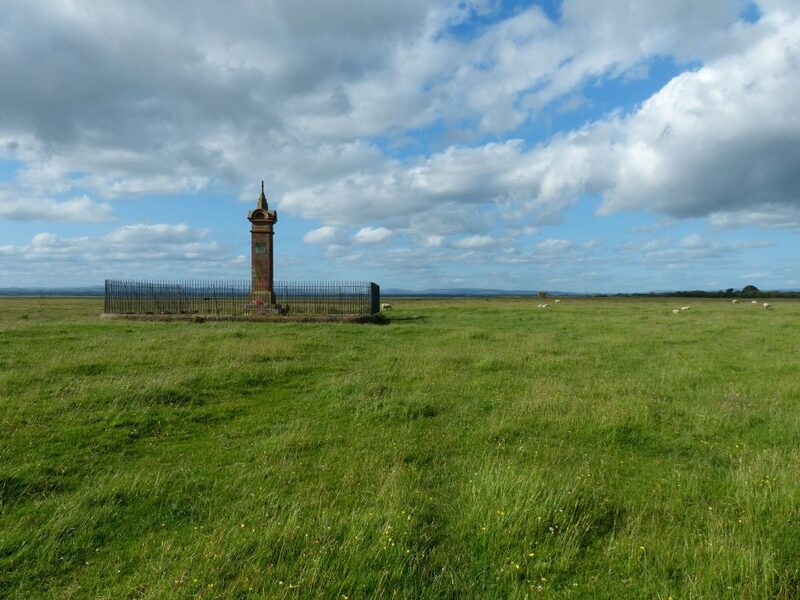 This is a photograph of Burgh marsh, near Burgh by Sands on the Cumbrian side of the Solway Firth, an isolated and windswept spot, where a lonely monument marks the death in 1307 of the Plantagenet King Edward I. This is also the place where the legendary racehorse Red Rum, 3 times winner of the UK Grand National race, once paid a visit. Burgh marsh has a long history of horse racing dating back to the 1690s. To raise money for Cancer research and to celebrate the racing history of the area the Burgh by Sands Cancer Research Charity committee, in 1978, decided they would organize a commemorative race meet to take place once more on the original course on the nearby marsh. Somebody suggested Red Rum the famous race horse, who by this time was retired from racing, should be invited to the Burgh Marsh race meet as an equine celebrity. A plan was hatched. Ginger McCain who had trained Red Rum was duly contacted. Nobody really thought that Ginger would agree to bringing this valuable horse to the village race meet, but much to everyone’s surprise – he did agree, and for the fee of £300 said that he would be pleased to transport his valuable ward to Burgh marsh race meet. On the day of the races it was windy and wet in the morning and there was some concern about the impact of the weather on the racing. Everyone waited and looked out for the horsebox that would signal the arrival of the famous guest. Worried looks were beginning to spread across the faces of the organisers who had contacted newspapers and had journalists arriving to cover the story for the local press. Suddenly the horsebox appeared in the distance making it’s way through the country lanes to the gateway on to the Marsh. Red Rum had arrived. The sun came out. Crowds of people travelled from Carlisle and local villages to see the famous racer. All went to plan, the day was a huge success raising much money for Cancer Research, and local history was made – September 3rd 1978 the day when the famous Red Rum, giant celebrity of the horse racing world, spent the day as the star guest at Burgh marsh races.